The symbolism of lotus flower is quite straightforward and self-explanatory, even if you aren’t familiar with its various cultural and historical representations. Just seeing a lotus flower in a muddy, murky pond is such a deeply contrasting, inspiring imagery. Who would’ve thought that something so glorious and captivating as a lotus flower could ever emerge from such a dark, seemingly dead place? The story about lotus flowers is an inspiring story about growth, development, and hope that even darkness and negativity can lead to glory and that our environment doesn’t completely determine our destiny and future. The lotus flower story is a tale of an underdog who has risen to glory despite all the difficulties and barriers along the way. When it comes to its symbolism in many different cultures, lotus has mainly been associated with the notions of beauty and purity. In Buddhism, the lotus represents loyalty and spiritual awakening, given the environment and conditions it emerges from. Lotus is also seen as a flower of rebirth and new starts, also thanks to its inspiring fight with the grueling conditions of its habitat. It also stands for spiritual enlightenment, as it opens up to the sun every morning which suggests inner strength and the hope of a new day. When it comes to ancient Egyptians and their culture, there is a strong and undeniable presence of the symbolism of lotus flower. In the Egyptian culture, lotus flowers (mainly portrayed in blue color) stand for rebirth, since the lotus closes at night, and then opens up again in the morning, which inspired the Egyptians to associate this flower with the adored Sun and its natural cycle. In certain hieroglyphics depicting the birth of the Sun, the lotus flower bears the Sun as it emerges from the water. On the other hand, lotus has also been associated with the notion of death. Ancient Egyptians believed that if a person was transformed into lotus, they would be granted rebirth. The Lotuses and Peonies ketubah represents these flowers in all their colorful, mesmerizing glory. This lotus ketubah design is exactly what you get when you combine the boldness of modern art with the rich cultural and historical symbolism of the lotus. 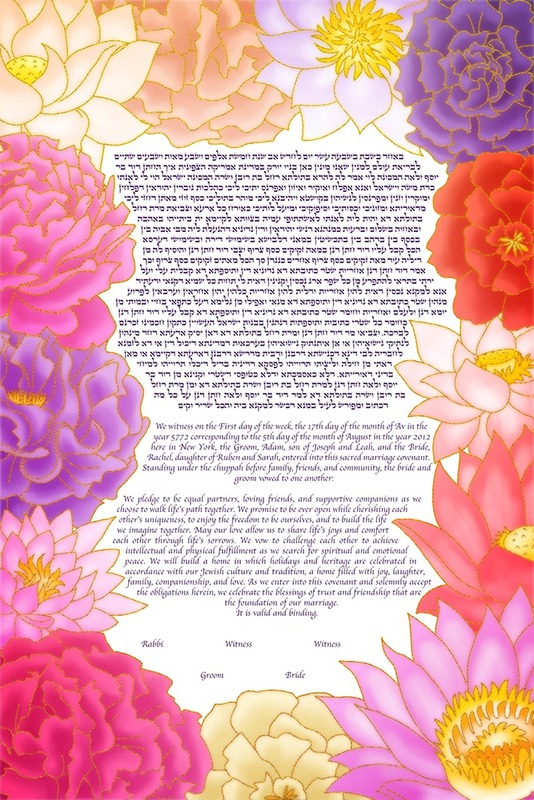 Whether you’re fascinated with its symbolism, the ancient tales and beliefs, or you’re simply a fan of lotus flowers and the aesthetics they bring to the table, we’re quite positive you’ll enjoy this vibrant lotus ketubah design.